1) How do I make a good track log? a. Before starting your trip, go into the Setup menu for your GPSr. If it has options for adjusting the recording frequency or quality set it to the best available. Usually this is shown as "most often". Turn on the GPSr and allow it a clear view of the sky for a good 15 minutes before starting the trip. This allows the unit to connect with as many satellites as possible. This increases accuracy and helps to maintain satellite lock. Clear the active track log (if you don't want it for something else). This makes the upload shorter and it is less work in figuring out what part of the track is the trail in question. Place the GPSr in a good location to receive the satellite signals. Usually on top of your pack works well. Be aware of where the antenna is located and the best orientation of the GPSr for signal strength. For instance, the Etrex style units use a patch antenna. They work best when oriented horizontally. When the trip is over, the best thing is to turn the unit off until you can off load the track. If this is not desirable, then save the track to the unit's memory. It is preferred to upload the "active" track instead of a "saved" track, if possible, as it will contain more detail. 2) What do you want me to send you? The track log. Whatever file format is convenient for you is fine with me as I can convert from most. If you have a choice then GPX is the best to send. The name of the trail. Any waypoints on the route, such as parking area, toilets, viewpoints, important route finding locations or anything else that might seem useful on a map. 3) What trails do you need? See the Trail List section for a list of current trails in the mapset. Feel free to send any trail data that you might have even if it is shown in the list. If we already have a trail, we will compare your data and look for descrepancies that could help to improve the mapset. We are also pleased to get "routes" of any ascent or descent that you have done. Any path that is not on a well defined trail is marked as a route (Rt) on the maps to let you know that the path is only one possible way to the destination. 4) I've uploaded your maps and I found an error or would like to see a change made. Please feel free to send any helpful information to our e-mail address. This mapping project is for you the map user and anything we can do to make it more useful is our goal. 5) I've installed your maps and I can’t see anything in Mapsource or Basecamp. a) First you need to choose the mapset. Click on “View” in the menu bar. Then choose “Switch to Map Product” and click on “Southern Alberta Trail Maps”. When chosen, a checkmark should appear next to the name. b) Next you need to be looking at a location on the map that has a trail on it. Open the test file by clicking on this sentence. Then center the map on the one waypoint in the file. Click on the “Waypoints” tab is the side bar. Right click on the waypoint “Forgetmenotpond” and choose “Show Selected Waypoint on Map”. The map will then center on that waypoint. c) Now zoom in using the magnifying glass symbol with the + inside in the upper toolbar until the trails show up. If you are still not seeing anything, try pressing CRTRL-G.
6) How do I get these to auto-route? On Garmin auto-routing receivers, the maps are able to auto-route to your destination. As the maps are transparent, normally another map will be “on” at the same time as the Southern Alberta Trail Maps. When you start a route, the units looks for the closest road. The routing is then calculated using the mapset that this road (or trail) belongs to. The routing can NOT use two map sets at the same time. If your route starts on a different map set and you want it to change so as to use the Southern Alberta Trail Maps, choose “recalculate” once you have reached one of the trails or roads on the Southern Alberta Trail Map Set. Every time the unit recalculates (manually or automatically) it will use the closest road or trail to determine which map set to use for the route. I want to go to a spot in Fish Creek Park. I am driving along and have City Select 7 and the Southern Alberta Trail Maps turned on. I ask the unit to auto-route to the location. As I’m on a road outside of the Southern Alberta Trail Maps, it chooses to route using City Select. The route chosen take me to the closest road to the destination and shows a straight line from that point. This is not the greatest way to get to that location. Fortunately I have the Southern Alberta Trail maps and can see a nice trail to take me there. I ignore the route and head towards the trailhead. Once I get off of the City Select route, the unit recalculates the route and uses the Southern Alberta Trail Maps instead as I have moved onto those maps. You may need to manually force the unit to recalculate depending on the situation. 7) If the road or trail is on both map sets, which map will the unit use in routing? The unit should choose the Southern Alberta Trail Maps in preference to any other maps as long as they are “normal” and not “transparent” maps. 8) I keep get route calculation errors when used with other routable maps. On the newer style units like the Nuvis and Colorados, Garmin has changed the routing algorithms and they do not work as well with transparent routable maps as the older units. It seems that if you are starting near a trail on the CAT maps, then it wants to use them for routing, which causes all sorts of problems. The easiest workaround is to turn the CAT maps off when you run into this problem and turn them back on when you get to the trail portion of your journey. Please give me feedback on this. If there is enough interest, I could make a non-routable version of the maps. 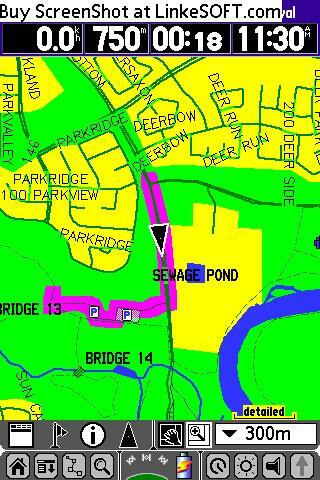 9) In Mapsource, I see roads and rivers, but they are not on the GPS. Starting in version 1.14, we have added roads, water features and some points of interest that are ONLY viewable within Mapsource. These have been provided to aid in route planning. The data is from Ibycus’ maps (www.ibycus.com). If you would like this data on your GPS, please install Ibycus’ maps at the same time as the CAT maps and you will see them together. Starting in version 1.18, this road data is now on a second detailed map. If you do not want these roads on the GPS, make sure NOT to send the map titled “Mapsource Only” to the GPS and only the “Southern Alberta Trail Maps”. See this page for more details. Starting in version 1.14, TYP customization has been added to improve the visibility of trails and unpaved roads. This customization only works within Mapsource and on newer style Garmin GPS units. Older units do not support this and the trails will appear as they normally did in the past. 11) What are the different lines for and what is "Thick" and "Thin". a) The thick lines are a bit wider and work best on the higher resolution units like the Oregon. The thin lines are better for low resolution units like a 64. Use what you feel looks best. b) There are four main "trail" types used. These give a rough indication of the type of trail, but you should be familiar with the local rules and not take these as gospel. Trail - These are meant to show non-motorized trails. They should be useable by foot and may be useable by bicycle depending on the local rules. As opposed to "routes", these should have a defined path. Route - A route is a possible path for non-motorized users. It is not defined or set but is a path that someone else has recorded and followed. ATV or 4WD trail - This is a motorized access off highway trail. It may be restricted to ATVs, Bikes or Trucks or a combination of them depending on the local area regulations. Gravel or 4WD road - This is a motorized access road that is either a gravel road or a 4WD trail.